Posted On July 23, 2018 by Team iCynosure. Green Tea Seed oil, scientifically known as Camellia oil has remarkable benefits for the human body. Traditionally for centuries, it has been used for cooking for the nutritional value it brings to the food, however, more recently the oil has found its way into numerous beauty products for its anti-oxidation properties. In skincare products, Green Tea Seed oil serves as a powerhouse antioxidant which promotes collagen synthesis while protecting the skin against air-borne radicals. The high concentrate of oleic acid in the oil helps lock in skin moisture while the epigallocatechin-gallic acid in the oil helps decelerate the ageing process. Read all about 'the importance of anti-oxidant skincare in your 30s' by Beauty Blogger Jhilmil D'Saha. Many beauty brands have included this magical ingredient in the products to bring in its benefits. Korea's 1st natural skincare and beauty brand, Innisfree launched in 2000 has put in immense research in the last 10 years to study the best green tea variety and cultivated it on the Jeju island to moisturise, hydrate and regularise all skin types. The Beauty Green Tea range is infused with 16 kinds of amino acids, 3.5 times more concentrated to bring the world of hydration to its users. This summer I tried their advanced Beauty Green Tea Range that promises to restore clear and dewy skin with its Dual-Moisture-Rising Technology of fresh green tea water and seed oil. I picked a CTM routine to check its effect on my skin with the gel-to-foam cleanser, seed serum and cream. Beauty Blogger Rajshree Sawant too swears by the Beauty Benefits of Green Tea and her takes us through her skincare routine. Simply put, I loved the effect of the products on my skin. The all-in-one cleansing gel absolutely melts into the skin, foaming into a rich lather while keeping the skin moisturised and healthy. The bubbly texture ensures no dryness or stretching of the skin even around the delicate skin. The seed serum offers great absorption creating a moisture barrier for the skin to breathe in while keeping the harmful radicals out. Finally, the seed cream offers additional hydration for the dry and flaky parts of the skin and even outs the skin tone, giving the skin a much needed brightened dewy look. 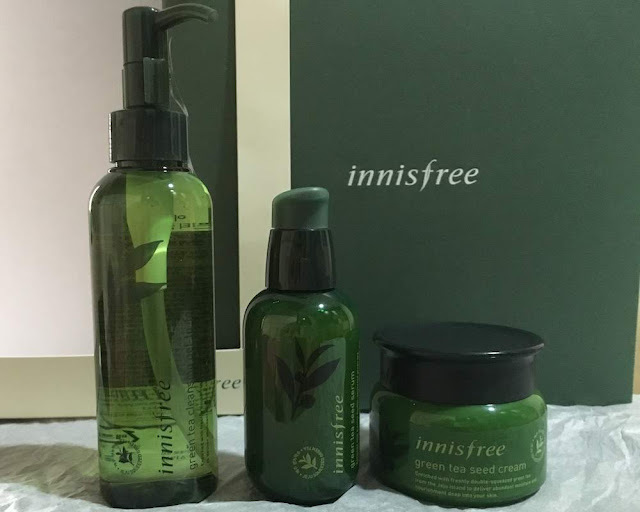 Innisfree has a range of products that you can use for a personalised #SkincareRoutine to ensure the best results. To know more about the Beauty Green Tea range and which products are right for your skin type, head to their stores now. Thanks for sharing the wonderful product of green tea extracts. I’ve used its green tea mask which was good. I’ll try this too. I love to buy it bcoz this is a beautiful essence, moisturizing with a gentle formula that very refreshing. The green tea seed oil fills skin with moisture while giving eliminating shine.